Video Mount Products will feature its multi-purpose IWB-1 “no profile” flat panel in-wall box adapter during ISC West 2016, held in Las Vegas, Nev. from April 6-8 at the Sands Expo and Convention Center, booth #1038. Now shipping, the IWB-1 has an MSRP of $108.95. 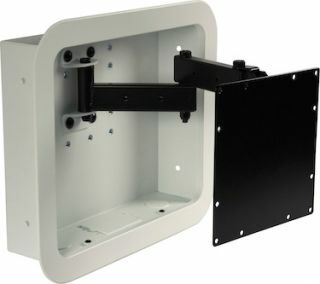 The VMP IWB-1 flat panel In-Wall Box Adapter can be used as a stand-alone in wall box, or can work in conjunction with the VMP LCD-1 multi-configurable universal LCD monitor wall mount, or the VMP LCD-2537 multi-configurable universal mid-size LCD monitor wall mount (both sold separately).